Finally...a chance to wear a piece of Red Sox history with these Fenway Park ballpark collector Sterling Silver bracelets. These are perfect for collectors and Boston Red Sox fans of all ages. The painted wood colors will vary, but all are sure to look great with any outfit. As these bracelets are made of authentic seats, no two are identical. Color and condition of the paint may vary from that depicted in the image. 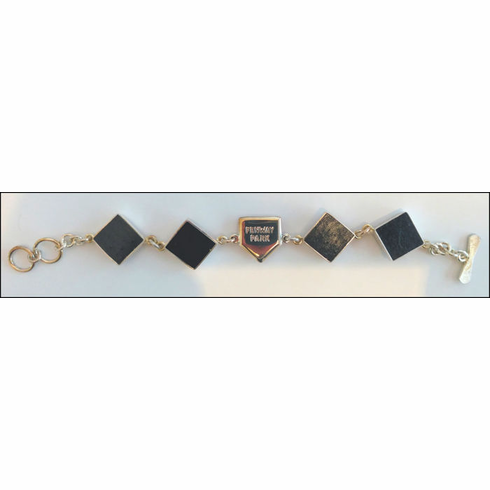 The bracelets feature four stadium squares with a sterling silver home plate that is hallmarked with the name of each stadium. Appx. 7.5" long, toggle closure.